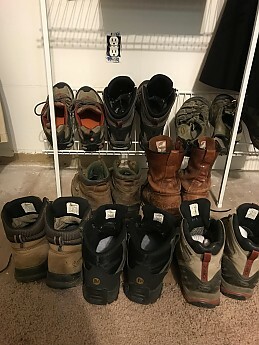 Just wondering if anyone else has a similar selection of hiking footwear (boots or trail shoes) or focuses on one or two pairs at a time...admittedly some of these are for my work in the field rather than recreational but that still leaves about four pairs for walking although two were Trailspace test items so not purchased. I also should admit that I was wearing another pair of boots while taking the photo! A common afflication Phil. Then I have western and riding boots. 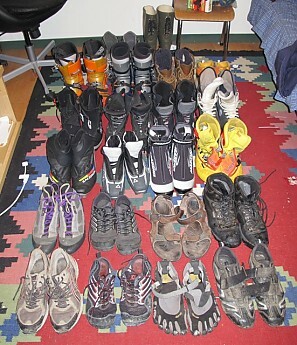 telemark boots, snow boots, and boot boots. We just need to admit we have a footwear fetish. It is great to be well shod. Yes I admit it. I’m a card carrying member of Boots Anonymous . Why one pair my salomons sat in the box in the closet for 5yrs. I just can’t help myself. But thru the help of BA, here recently I was finally able to give and throw away about 5 other pair. Well that makes me feel better! 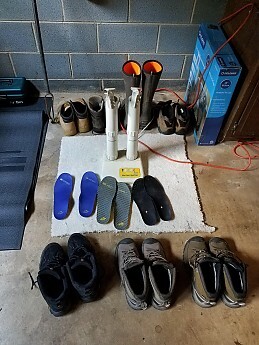 I may have to use this photo next time my wife mentions the piles of boots! I refuse to take an incriminating photo, but here is a rough inventory. -2 pair of approach shoes, one of which is beat up and about to get relegated. these top 7 pair are shoes i actually hike in regularly. 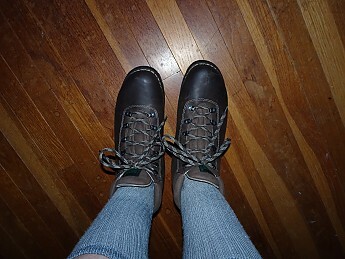 -insulated winter snow boots - barely worn in Maryland but nice for some winter walks and great for snowshoeing. -relegation: so worn they aren't worthy for anything more than beater purposes, but i keep them around. I have four or five pair in this category that live in the basement. "The Only Gear You Have to Fear is Gear Itself"---Frankie Roosevelt, our first and only backpacking president. wasn't Theodore Roosevelt also something of a backpacker? He was quite the quotable outdoors man: "Walk softy and carry a big flask." "I can stop buying backpacking gear any time I want. I've done it hundreds of times." Problem? Was on Mansfield last week when I noticed that my Standards were starting to drop a few bottom stitches. Took them in to the cobbler this morning and this pair of Light Weights followed me home.